The process is this. Operating at pressures of 1000 psi+ Koolfog produces micron-sized water droplets that, while evaporating and turning to vapor, removes heat from the air, cooling the surrounding area. The dry fog produced by a Koolfog system reduces outdoor temperatures by as much as 35 degrees Fahrenheit, which makes even 100+ degree days comfortable. Systems are customizable and can be expanded to fit large stables, run-in type sheds, or designed to target individual stalls. Our systems have been proven to help keep horses safe and comfortable, even in extremely warm temperatures. 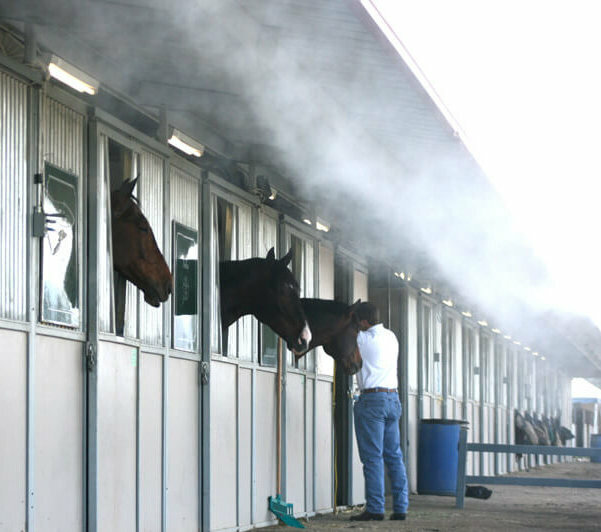 Koolfog’s equine designs often combine the air cooling provided by high-pressure misting with fans that circulate the air, target specific spaces or increase the efficiency of evaporation depending on the requirements of the environment. Fans are sized based on the layout and design of each equine facility and placed in tandem with misting to moderate temperatures in equine facilities for horses and horse owners alike.